Just swap out the 300px with whatever your original, desired value for width was. Would love to hear if anyone else is seeing the issue and if there are any other fixes. In addition to this, there seems to be a lot of changes currently going on in Yahoo's different email clients. Yahoo adds overflow-x/y:auto when using max-width/height. This means that max-width:50px; max-height:50px; will be replaced by overflow-x:auto;max-width:50px;overflow-y:auto;max-height:50px;. This can be fixed by adding an overflow:visible; after both declarations in your styles, except for IE. In Internet Explorer, Yahoo adds -ms-overflow-x:auto; -ms-overflow-y:auto; that can't be overridden (as far as I know). 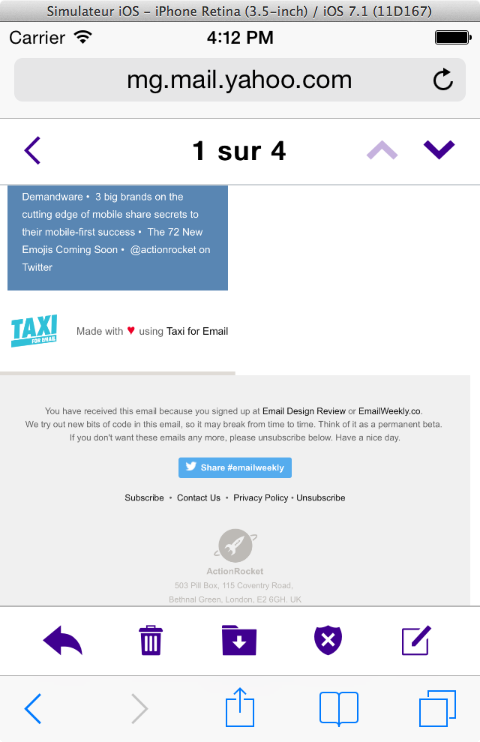 Yahoo on iOS supports media queries… again ! That's probably the only good news to come out of these changes. Media queries seem to be supported again. I've successfully tested it in the mobile app on iOS. The mobile webmail however doesn't seem to support them yet. I have a section of an email jutting way out to the right in iOS Yahoo Mail app outside the width of the email, while the rest of the email is flush to the left and zoomed out looking, not displaying full width in the screen. 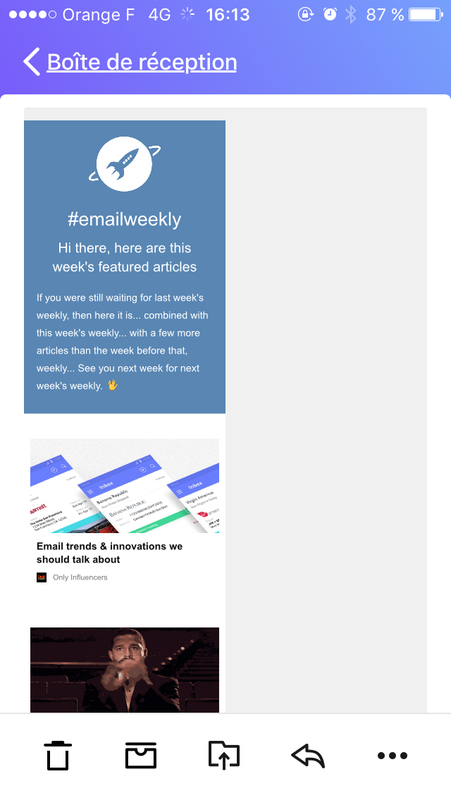 It now looks like a broken non-Fluid Hybrid email! Sigh. I have a same on lots of templates. I have to figure out yet why this happens. Is this in an update to the iOS app or did it happen on the back end? I believe back end because the rendering changed over the course of the day yesterday without any app updates taking place. Keep in mind, though, that this fix won't work on percentage based column widths, due to how the table layout algorithm works. What I ended up doing was to just add a max-width to every width declaration that was set to other value than 100%. You don't even need to add the !important modifier to the max-width declarations. This has worked beautifully for the Bento hybrid template. I had to convert a couple of percentage based grid units to a fixed size, not a big deal though. It was not required for the component to be percentage based. Add a max-width declaration to every width with the same value. You don't need to add a max-width for 100% width values. You don't need to add the !important modifier to width or max-width. Please note, as others have already stated it seems that Yahoo has rolled back this change (I could confirm it by inspecting Yahoo's parsed email source code). They've stopped converting width into min-width as of June 8th, 2016. None of these workarounds would be required anymore to make width work on Yahoo Mail. It should be safe to use any fixed or relative width value again. In the event they reintroduce this same dreaded behavior in the future we at least know how to counteract it. Ugh, it's not just structure but images with CSS width as well... what a disaster! It appears to be fixed on my templates. The CSS rule needs a selector, e.g. And as pointed out by Wilbert Heinen, removing the space between the value and !important will stop Yahoo! Mail from stripping the !important declaration. Ah, nice catch, Stig! updated the above to reflect that. This doesn't seem to have any issues at all. I am currently working on a Z shape Hybrid with normal and reverse stack. Works everywhere perfectly. Have a carousel in there too. Works fine. Maybe this is because I have no width in the CSS? Still testing, but looks like this worked for me on desktop. Thanks, DeeDee. Has anyone had issues with Yahoo taking out the height? It seems to be taking out the height attribute and replacing it with min-height. I am getting table cells that don't show up at all. Really? I've not seen that one yet (thankfully!) Could you post a piece of your markup? I'm trying everything I can to get the height on that empty cell to show up correctly. I see height"40" instead of height="40". THANK YOU! Sometimes when you look at something for so long you miss the details. That fixed my issue. I have noticed this on images — inline CSS height: auto being changed to min-height: auto! Both CSS width and height on images are being changed to min-width and min-height for me. Interesting. I wonder if you can declare a height: auto !important or would that, too, be converted over? I'm seeing this as well! Checking this morning (israel time) it seems that they rolled it back. Either that or my fix is working. I just encountered the same issue. Was fine yesterday, NOT TODAY. Your comment and Stig's are the first I have seen found so far. I have been dealing with this issue all day. preparing a new email which looks AMAZING everywhere and then BAM yahoo strikes again!! So i'm trying to use this fix but i'm having little luck. The big issue for me is in the 2 column layout it's just full widthing both columns making it look attrocious. Do I attach class foo to the column? Trying this fix with Stig's amendments and still looks like crap. Just ran across this thread because I'm having the exact same issue. ".foo" is just a placeholder for whatever your selector is, so instead you might want ".col-2" or whatever selector you used for the columns. I suppose if you wanted to add a foo class to all of you columns that would work also, but why do that when you can be lazy and change just one .foo in the head. Thanks Brett. I was about to try your fix but it seems that either my hack worked or yahoo rolled back the "fix" bc checking this morning my email looks beautiful again. 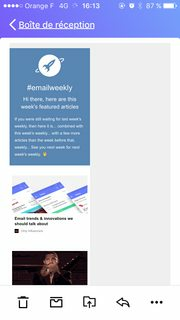 I'm using foundation for Emails 2.0 and I ran across this issue as well. The results of an email on acid test (sorry guys - I use them for my testing) are below. min-width is definitely causing the problems. I'm curious if anyone else using Foundation for Emails has tried the hack below? Dedicated to everyone in this thread. Looks like they've fixed the min-width issue. I’ve used that for a while, and it works well.